Another beauty from my mother! These were absolutely delicious and so juicy. 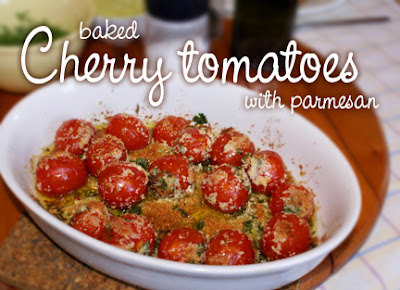 Soon fresh cherry tomatoes will be growing everywhere, so pick some up and try this dish. Great as a side to rice or pasta. Drizzle oil into a 13x9" broiler-proof caramic baking dish. Add tomatoes, rolling them around to coat with oil. Sprinkle with salt and pepper. Top with parsley and cheese. (Can be made 1 day ahead -- chill covered until ready to bake). Preheat oven to 400 degrees. Bake tomatoes just until plump and shiny but not split, about 20 minutes. Then switch to broiler. Broil until tomatoes begin to split and cheese begins to color, about 2 minutes. Serve hot or warm. VARIATION For a non-dairy rendition, replace parmesan cheese with 1/4 cup bread crumbs mixed with 2 Tbsp nutritional yeast flakes. I just had a sudden flashback to when I was a kid, and my Dad made stewed tomatoes. It's not quite the same, obviously, but it was still really good. I'm confused on the Kasha variant, though. Aren't Kasha's supposed to stay away from tomatoes? Apparently cooked tomatoes are okay for kaphas, in small quantities, but a substitution for zucchinis is always an option. I hope this sparks a little excavation into your memory for how you could recreate your dad's tomatoes!